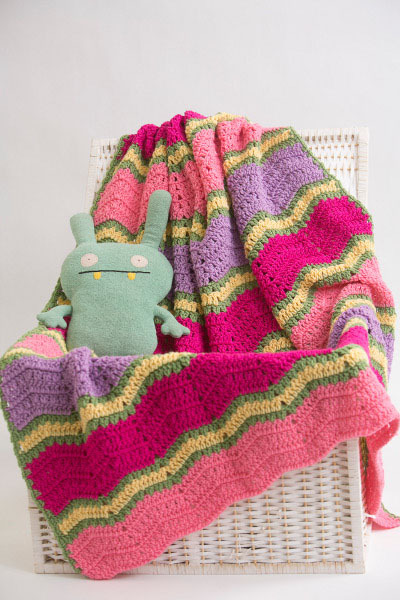 This bright, imaginative afghan is a must-make blanket for any child’s room. 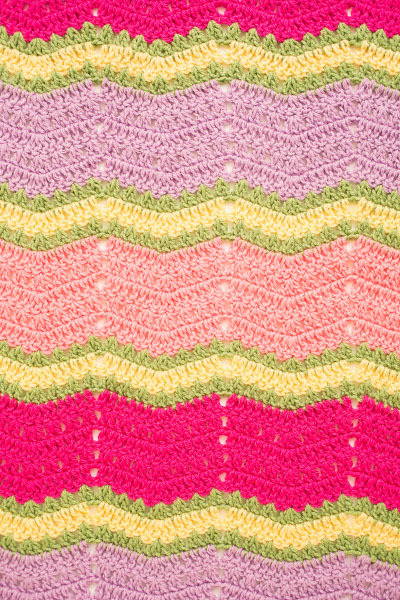 You could even drape it over a solid-colored couch for an extra dose of color. Row 1 (RS): With perfect pink ch 138, dc in 4th ch from hook, 1 dc in each of next 5 chs, *3 dcs in next ch, 1 dc in each of next 6 chs, skip 2 chs, 1 dc in each of next 6 chs, rep from * across ending work 1 dc in each of last 7 dcs, turn. Row 2 (WS): Ch 3, (skip 1 dc, 2 dcs in next dc) 3 times, *skip 1 dc, 3 dcs in next dc, (skip 1 dc, 2 dcs in next dc) 3 times, skip 2 dcs, 2 dcs in next dc, (skip 1 dc, 2 dcs in next dc) 2 times, rep from * across ending skip 1 dc, dc in last dc, turn. Row 3: Ch 3, skip 1 dc, 1 dc in each of next 6 dcs, *3 dcs in next dc, 1 dc in each of next 6 dcs, skip 2 dcs, 1 dc in each of next 6 dcs, rep from * across ending skip 1 dc, dc in last dc, turn. Row 6: Join tea leaf with slst in first st, ch 2, skip 1 dc, continue with Row 2, fasten off and turn. Row 7: Join cornmeal with a slst in first st, ch 2, skip 1 dc, continue with Row 3, fasten off and turn. 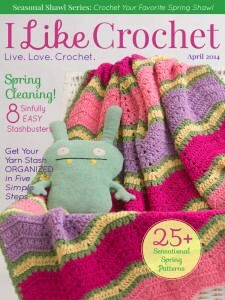 Row 9: Join shocking pink with a slst in first st, ch 2, continue with Row 3. With tea leaf and WS facing work along straight edge starting at bottom, 2 sc in first dc, [ch 1, 2 scs in next dc] across and fasten off. Work along opposite edge starting at top, 2 sc in first dc, [ch 1, 2 scs in next dc] across and fasten off. Weave in all ends and trim.